Whenever we stock out of this watch we immediately receive new requests - it's that popular and is a true classic within the Sinn family. This watch is noted for its clean design and easy readability. Verified Owner Comments: After much deliberation in choosing which Sinn I would purchase, the 356 Sa became my first German watch. Being the first time I made a considerable purchase without being able to hold the watch with my own hands, it was a moderate leap of faith. When the 356 Sa arrived, every expectation of mine was thoroughly met! This is a very hi-quality product that carries extreme value for the amount invested. The craftsmanship is outstanding! Absolutely stunning! The customer experience when purchasing from WatchBuys was flawless! The communications from beginning to end were perfect! 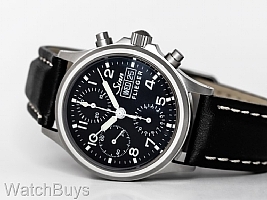 WatchBuys made the entire process easy and comfortable by explaining their return policy and giving me the option to view the 356 Sa at home before making the final commitment. I will definitely purchase another Sinn from WatchBuys in the future!